Thanks to modern orthodontics, you have more than one way to straighten crooked teeth. In fact, you don’t even have to wear bulky metal braces to have a more confident smile. Invisalign has revolutionized the way teens and adults correct bad bites, close unsightly gaps and straighten crooked teeth. Here’s a closer look at why you may need to consider this patient-preferred option in orthodontics. The Invisalign process is easy and painless. Once a we take scans and create a 3D model of your teeth, we can customize a digital treatment plan for each aligner set. You’ll wear each aligner for about two weeks before moving on to the next set. 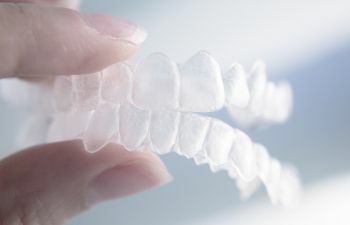 These clear plastic aligners are uniquely designed to gradually and gently move your teeth into ideal position over time. Whether you are a socially-conscientious teen or a business professional in the public eye, it is understandable that you may want to keep your orthodontic treatment a secret. Unlike flashy metal braces, your Invisalign aligners will provide ideal discretion. Their thin, clear design is nearly invisible to others. Plus, you can remove your aligners for big events! Traditional braces aren’t necessarily painful, they can be quite uncomfortable. With bulky metal brackets protruding from your teeth, it is common to suffer gum and lip irritations along with sore teeth. The smooth clear plastic material of Invisalign aligners eliminates the fear of dental discomfort during orthodontics. There’ll be no need to carry wax around in your pocket! While the overall treatment time of Invisalign versus braces can often be lessened, many patients are most attracted to the fact that you only need to come in for a check-up every 6-8 weeks as an Invisalign patient. If you are busy or simply short on time, this is an ideal option in orthodontics. There is no denying the fact that brushing and flossing becomes extra challenging when you wear braces. This often leaves teeth dirty, stained and ridden with bacteria and plaque until the brackets come off. With Invisalign, you can simply remove your aligners and brush and floss like you normally would. With fixed brackets and wires in place, there is a list of foods that braces wearers simply must avoid. However, if you are not willing to sacrifice your dietary freedom while straightening your smile, then Invisalign is right for you. There are no restrictions in food or drinks with Invisalign, as your aligners are easily removed at mealtimes. These are just a few of the reasons why adults and teens across the country are turning to Invisalign as a modern, highly preferred solution for a straighter smile. To learn if you are an Invisalign candidate, call West Hill Family Dental.